Protesters in Foreign Secretary Jack Straw's Blackburn constituency were left disappointed after he failed to turn up for a planned meeting. 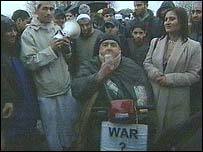 About 200 anti-war demonstrators waited outside a Blackburn community centre where Mr Straw was due to hold an advice surgery on Friday. Organisers hoped to try and challenge him about preparations for a war against Saddam Hussein, which are in their "final phase". But Mr Straw failed to turn up to the centre after a bomb scare. The group had been moved away from the building following the security alert, which was later blamed for Mr Straw's absence. Parvaiz Awan, who organised the demonstration, said: "These are the people of Blackburn who Mr Straw should be addressing, not the people of Washington. We are terribly disappointed."